Sometimes you forget, you care so much, at the time, and time moves on. Sierra Leone, recovering from conflict, eleven years on. I have been proud to be working with ActionAid over the past year. So many charities work to make a difference, and it is great to be amongst them. ActionAid are supporting Sierra Leone to ensure those who suffer most because of conflict- children- are given the basics they need: water, food and an education. And now, eleven years on, Sarah Alexander is playing a key role in the #Rebuild campaign. Best known for roles in Coupling, Smack the Pony and soon to be star of Jonathan Creek, Sarah Alexander is able to lend her name, and her influence. Just like bloggers, and those on social media. As people, as a Voice. 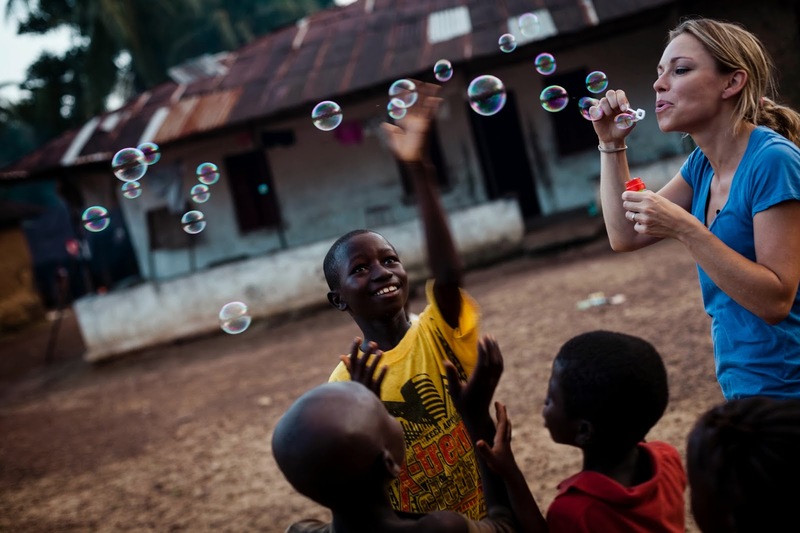 Sarah has just returned from Sierra Leone with the ActionAid. Travelling to the west African country as part of the #Rebuild campaign Sarah saw first-hand the devastating proof that children who grow up in counties at war suffer the most. Visiting projects that the charity has funded, through child sponsorship, it became clear to Sarah that child sponsorship makes a huge difference to the lives of children and their communities. However, as Sarah travelled around the country that is still recovering 11 years on from a bloody civil war, she was shocked by how much work there’s still to do to rebuild their lives. Sarah, a mum of two, fell in love with the country and says: “It was so inspiring to meet many homeless and orphaned students who have come back from so much: who faced hell on earth, survived and are now, with the support of ActionAid, developing skills that will help them change their lives for the better. “500,000 people were killed in the war and almost half the population were displaced and I’ve overwhelmingly had my eyes opened to how extreme the poverty is 11 years on. Sarah’s trip marks the beginning of ActionAid’s campaign to rebuild the shattered lives of millions of children growing up in countries scarred by war. Over 2,000 UK child sponsors are needed for children in Afghanistan, Pakistan, Democratic Republic of the Congo, Liberia, Sierra Leone and Rwanda.